Salicylic acid is an organic acid with anti-inflammatory properties widely used to treat acne. Aspirin, which converts to salicylic acid in the stomach, is used to treat anti-inflammatory conditions and fevers, according to a 2006 review paper published in the "Proceedings of the Nutrition Society." The paper also cites evidence that daily aspirin use may reduce the risk for developing colon cancer. Many fruits, vegetables and spices contain high amounts of salicylic acid, but according to the review, it is not certain if eating salicylate-rich foods can potentially decrease your risk of developing diseases such as cancer. 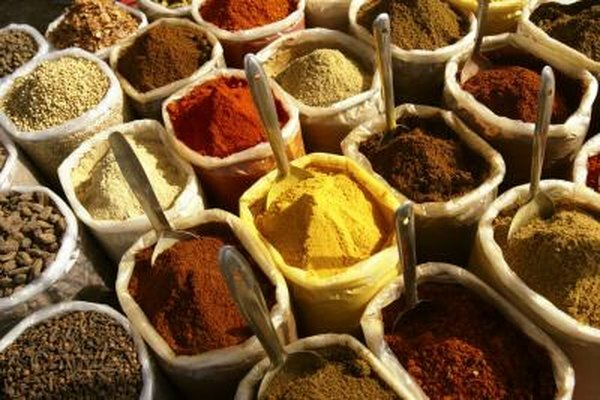 According to the "Proceedings of the Nutrition Society" paper, spices such as cumin, paprika and turmeric contain high amounts of salicylic acid. Vindaloo curry has as much salicylate as a low dose of aspirin. Other spices rich in salicylates -- values higher than 0.5 mg per 100 g of food -- include canella, curry powder, dry dill, oregano, rosemary, thyme and mustard, according to Food-Info.net, a non-profit initiative of Wageningen University in the Netherlands. Fruits such as apricots, blackberries, blueberries, cantaloupe, dates, guava and raisins contain substantial amounts of salicylic acid. Granny Smith apples, fresh avocados, cherries, red grapes, fresh mandarin and fresh tangelo also contain high amounts of salicylic acid. According to the "Proceedings of Nutrition," soups made from organically grown fruits and vegetables contain higher amounts of salicylic acid compared to pesticide-treated products. According to Food-Info.net, vegetables with salicylic acid content greater than 5 mg per 100 g of food include champignon, green pepper, olive, mushrooms, tomato, radish and chicory. Other vegetables rich in salicylates include alfalfa, broccoli, cucumber, fava beans, spinach and sweet potato. Nuts such as almonds, peanuts, pine nuts, macadamia nuts and pistachios also have a salicylic acid content greater than 0.5 mg per 100 g of food. Proceedings of the Nutrition Society: Is There a Role for Dietary Salicylates in Health? Food-Info.Net: What Is Salicylic Acid and in Which Foods Does It Occur?